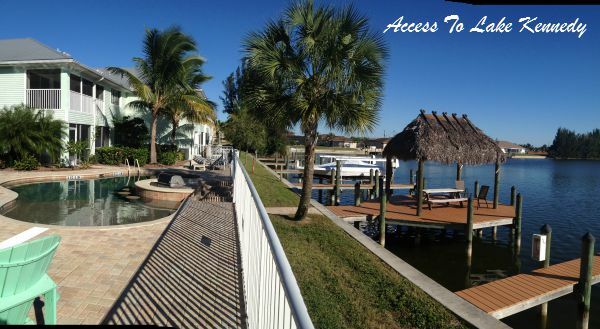 Mandalay Cove is a waterfront boating community in Cape Coral, just across the river from Fort Myers on the banks of Lake Kennedy. It is the largest lake in Cape Coral and is also fresh water, boaters are allowed to water ski and use other recreational watercraft. The BMX Boat Ramp is the closest access point which is just minutes away. Amenities include a large heated pool, and hot tub. You'll love the poolside grill and tiki hut for convenient lunch and refreshment. There's also a community boat dock and fishing area. Built in 2006, the two and three bedroom, two bath condo units have all the upgrades, from granite counter tops to designer kitchens, tile floors, high ceilings, and screened porches that overlook the water. There are two floor plans, 1,295 and 1,720 square feet with a total of 20 units in the complex. There are five buildings with 4 units to a building. Bathrooms have stone counter tops and glass shower stalls, spacious and elegant. Some of these Key West style condos overlook the pool and grounds, and all are on the lake front with private boat docks included in the purchase. Prices range from about $170,000 to $200,000, depending on size and location of the building. As of this writing March 2019 the last unit to sell in Mandalay was a three bedroom 1720 square foot unit for $195K in February 2018. If you're looking for an affordable water front condominium with all the extras, this is one of the best. Let me show you what Mandalay Cove has to offer, if any are available. Call me today!